The Massagetae – their name meaning possibly the “Great Saka Horde” analyzed as Ma-Saka-ta in early Iranian –, a tribal confederation of the Central Asian region between the rivers Oxos and Iaxartes, are sometimes considered to be the most probable inventors of the fully armoured cavalryman (including his horse) that is the cataphract. According to another theory, the rearmost roots of the fully armoured cavalryman are located in the early Medes of the Zagros Mountains (the Uman Mada, the ‘Median Horde’) or in the Assyrian conquerors of the Middle East. According to this theory, the Iranian Medes managed to evolve the famous Nisaean race of horses through racial mixing, making its horses strong enough to be able to bear the weight of metal-armoured cavalrymen. Starting from the Medes or the Massagetae, the type of the cataphract cavalryman gradually spread to almost all the Iranian tribes and soon to the neighboring non-Iranian peoples. Over a period of more than two millennia, the spread of the use of the cataphract cavalryman was magnificent reaching to the East the Pacific coasts of Asia (China and Indochina) and the Japanese Archipelago, to the West the Atlantic coasts of Europe and also Britain, and to the South the kingdoms based on Timbuktu and other Muslim metropolises of the African interior. From the second to the fifth centuries A.D. the Late Roman army evolved from an army in which the infantry was the main fighting force to an army in which the cavalry was holding the leading role. This decisive change was necessary for several reasons, both internal and external, but the main cause was Rome’s wars against the Iranian peoples (Parthians, Sassanid Persians and the Sarmatian tribes) on her eastern and northern borders. 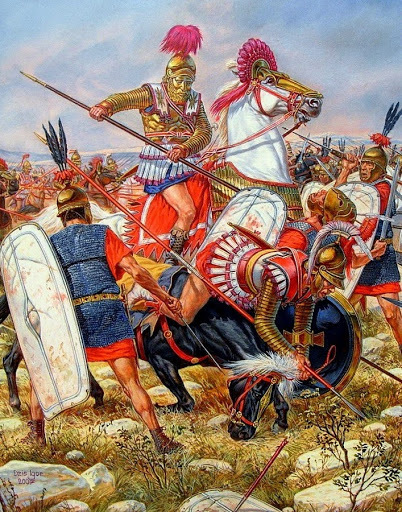 The specific peoples had at their disposal powerful cavalries that included cataphracts (or clibanarii) protected from head to foot with helmet and full body metal armour (bronze or steel), usually scale or mail and later lamellar. (The material of the cataphracts’ armour in their entire history could be also leather, quilted fabric, bone pieces and other). 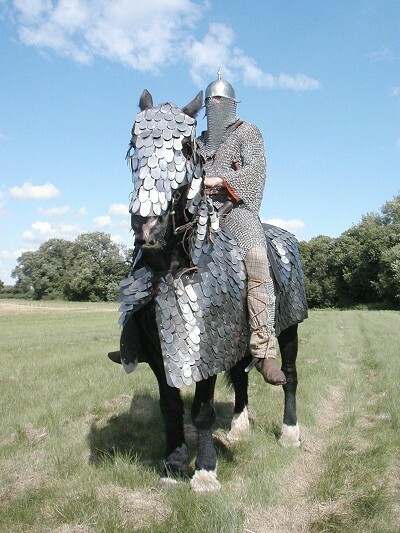 The same type of armour often protected their horses partially or almost wholly. These cataphracts were using the kontos cavalry lance (contus in Latin) as their main offensive weapon with a length of 3-4 m, and as secondary weapons the long sword (spatha), the bow, the mace and others. The ultimate origin of the cavalry lance is rather Macedonian. 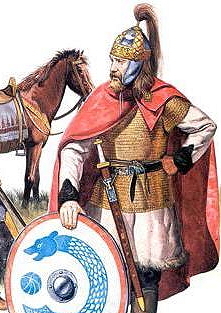 It has been suggested that its ancestor is the xyston (elongated lance) of the Macedonian and the Thessalian cavalry, which was adopted by the Massagetae and other Saka tribes of Central Asia when they first encountered the Hetairoi (Companion) and Thessalian cavalry of Alexander the Great. To the east of the Roman territory the Parthians, the Atropatene Medes, the non-Iranian Armenians and the Elymaeans and later the Sassanid Persians and the Semitic Palmyrenes, and to the northeast the Sarmatian Roxolani, Iazygae, Royal Sarmatians, Alans-Aorsi and others were using the cataphract cavalry as the main assault force of their armies, inspiring the Eastern Goths (Greuthungi, Turkilingi, Rosomonii, Heruli and other tribes), the Romans, the West Goths (mainly the Tervingi), the Vandals (mainly the Taefali), the Burgundians, the Gepids, the Longobards and others, to establish units of cataphracts and horse-archers as well. These practices and tactics of cavalry warfare, together with the related weaponry and armoury were inherited by the Romans to the Byzantine and the Western European armies. In Western Europe they were inherited by the Western Romans, the Goths, the Longobards, the Burgundians and others, laying the foundations of medieval Chivalry. Later the Franks and the Normans further improved the standard of the cataphract cavalryman, developing this standard to the final form of the medieval European knight. A: Massagetian or other Saka cataphract 4th century BC. Note that he does not yet use the cavalry lance. Achaemenid Iranian heavy cavalryman (cataphract), 5th -4th c.BC (credit: Warfare in the Classical World, Salamander Books). 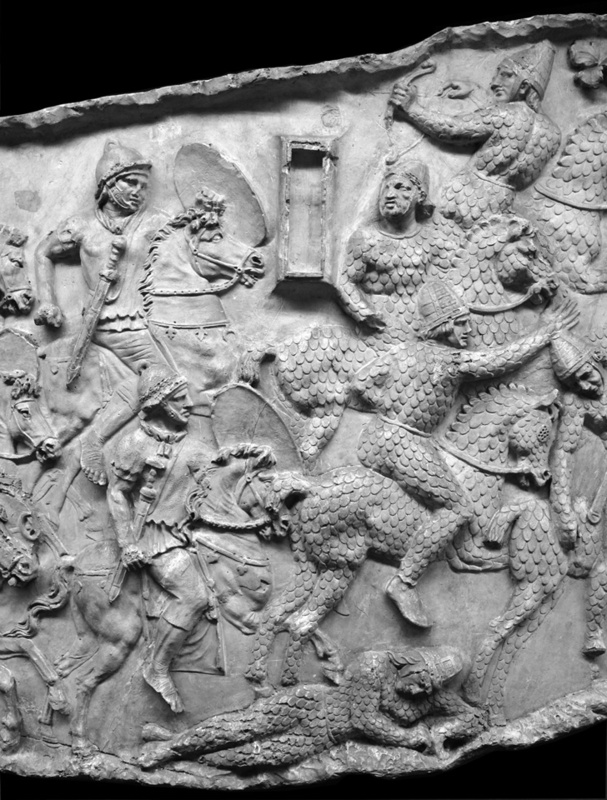 Roxolani (Sarmatian) cataphracts on the right wearing scale armour, at Trajan’s column, 101 AD. 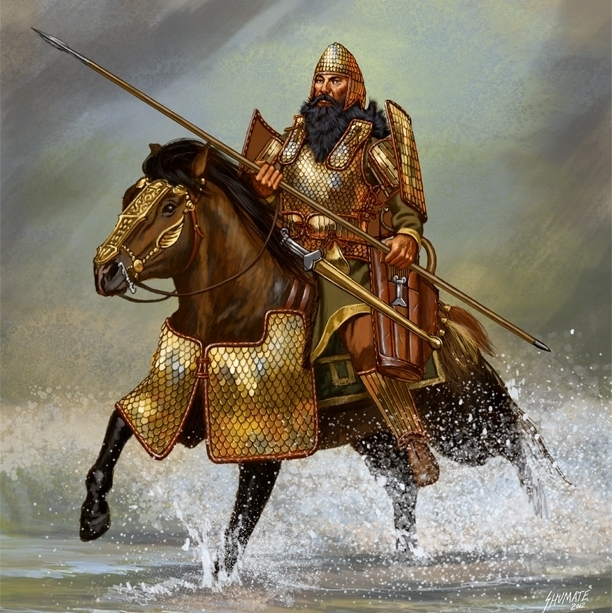 European Scythian cataphract warlord c.300 BC, artwork by Johnny Shumate (credit: Johnny Shumate). The lower part of his armour (not shown here) could be similar to that worn by the Achaemenid cavalryman above. 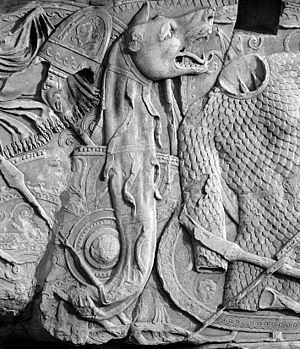 Spagenhelm, scale armour and other equipment of Sarmatian cataphracts in a Roman triumphal relief. Seleucid cataphracts confronting Romans, 2nd century BC. Artwork by Igor Dzis (credit: Igor Dzis). A re-enactment of a Sassanid grivpanvar (Clibanarius in Greek and Latin) (Wikimedia commons). 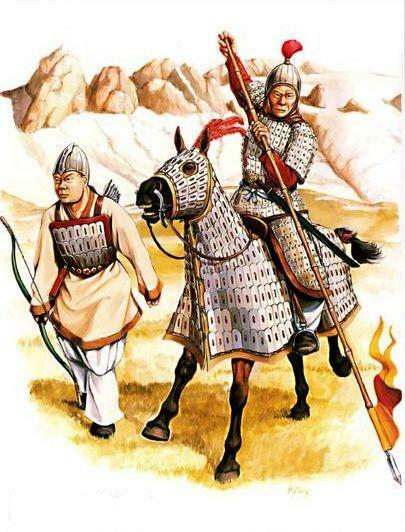 A Chinese or Steppe “barbarian” cataphract (and an archer) of the Northern Dynasties, 4th-6th centuries AD. Artwork by Michael Perry (credit: Osprey publishing/ Michael Perry). A Goth heavy cavalryman (semi-cataphract). 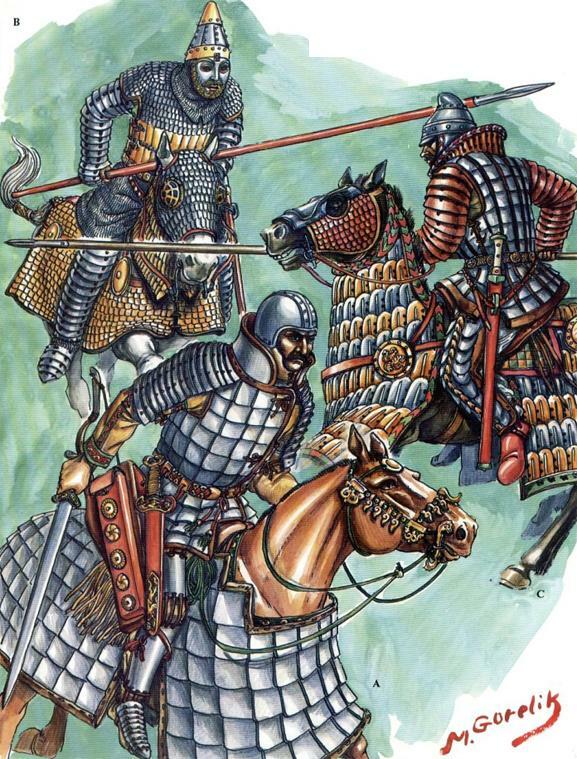 He and his horse could bear armour of the Sarmatian type (an actual cataphract) but the horses of the Gothic cataphracts were almost always protected only by frontal semi-armour, as it is demonstrated in the archaeological and other data. Artwork by G. Embleton (credit: Osprey publishing/ G. Embleton). 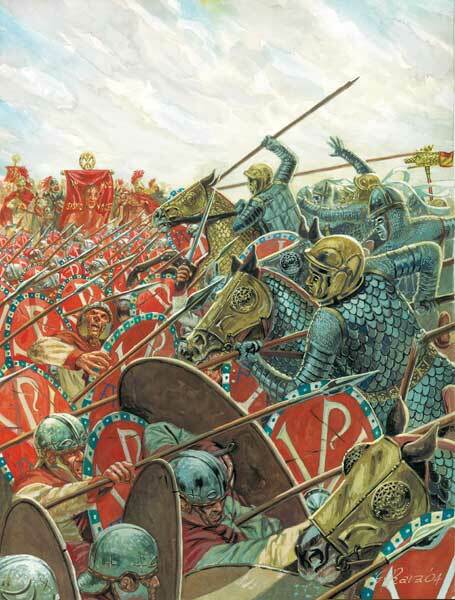 Roman cataphracts in the battle of the Mulvian bridge (Artwork and credit: Giuseppe Rava). 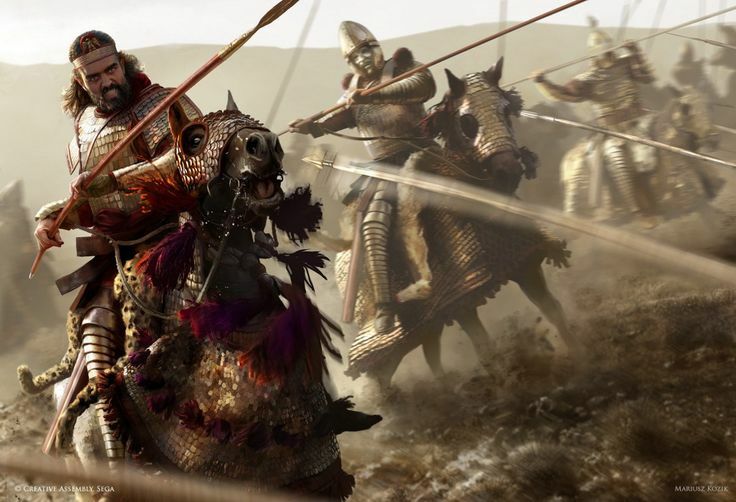 A Gök Turk (Tujue) cataphract, 6th century AD, artwork by M. Gorelik (credit: M. Gorelik).